Ultimate Warmups and Pairs Throwing: Have the class do the warm-ups and spend time throwing in pairs found in Lesson 2. Scoring a point: To Score a goal a player must catch the disc and have their first point of ground contact be fully inside of the end zone lines. If at any time a player makes a catch while their first point of ground contact is outside or touching a border lines of the field, they are out-of-bounds and it is a turn over to the other team. 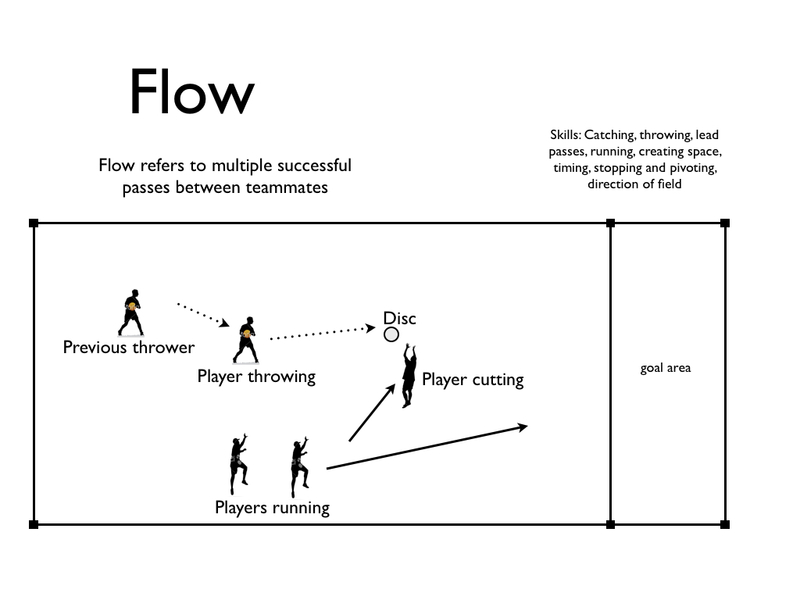 Flow Game: Groups of players strive to complete several passes in succession – “flow” = a string of continuous passes down the field. Groups line up together on one end of the field; one player holds the disc. That player says ‘go,’ and the other students without the disc can run anywhere on the field in front of them. The players must complete consecutive passes into the opposite end zone (one point). Preferably, by catching lead passes out in front of them rather than being stationary when the catch it. Players must ‘flow’ all the way across the other end zone line. Every student in the group must catch at least one pass for the goal to count. Flow Challenge (with pull): Play the flow game from a live ‘pull’ and measure your successes against an opposing group of players. A Pull is a full field ‘throw off’ from one team to the other to start a point. In this case there is just one player pulling to a whole team and then that player leaves the field. Only after a pulling player releases the pull can opposing players leave their own line and begin the point. Either catch the pull on the fly; or let it land and start from where it landed. If the pull went out-of-bounds, start the point anywhere on your own goal line. Maintain the player groups from the Flow Game OR Make New Groups of 4-6. Each group is paired with an opposing group. One group is trying to score more goals in the end zone (as per the flow game rules) than the other group – given equal chances. The inactive group waits off to the side (e.g. does not play defense). Drops, grounded throws, or out-of-bounds is a turnover and no points. Switch the active group after every score or turnover.